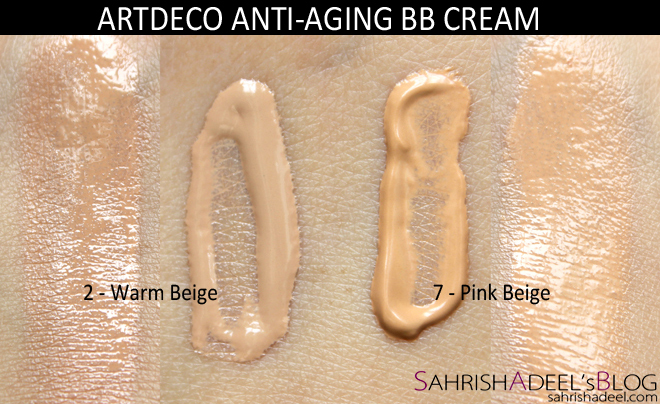 Artdeco Anti Aging BB Cream - Review, Swatches and Before/After | Sahrish Adeel - Malaysia based Pakistani Beauty & Lifestyle Blogger! When you never think you will ever fall in love with another BB Cream but then you try Artdeco's Anti Agin BB Cream. Let's see why I loved it. ARTDECO Anti Aging BB Cream is an age defying beauty balm which rejuvenates the skin. Ideal for sensitive and more demanding skin types, Anti Aging BB Cream delvers 10 skin caring characteristics in one easy to use, innovative makeup product. This Oil free cream provides the skin with improved elasticity, tone and cell vitality whilst reducing the depth of wrinkles and infusing the skin with vital moisture. Anti Aging BB Cream has a light coverage which masks imperfections and offers anti-ageing benefits and SPF 15 sun protection against harmful UV rays. Small spherical Particles surround the face like a veil of silk and provide an immediate lifting and soft focus effect. The extremely light and creamy Water based texture blends effortlessly into the skin and has a smoothing effect on the complexion. This tinted anti-aging beauty balm is a 10 in 1 multifunctional cream which visibly reduces signs of skin aging. As you can see in the pictures, I have two types of bottles for this BB Cream. The bigger one is the actual packaging but the smaller one is the tester. The company rep sent me to test the shade. Artdeco Anti Aging BB Cream comes in a squeezable plastic bottle containing 30ml of products. It comes in two shade only. The packaging is quite sturdy and the formula is creamy to liquid. You know how much courage it requires to put up before and after photos when you don't have that perfect skin anymore? Oh well, here I am. From now onwards, you will get to see my without makeup face a lot more than before. I have applied the cream with my fingers and have used only one sheer layer without any base/primer/moisturizer underneath. The lipstick I am wearing is CSP's Pure Matt Lipstick in Gossip. Three words; I Love It! 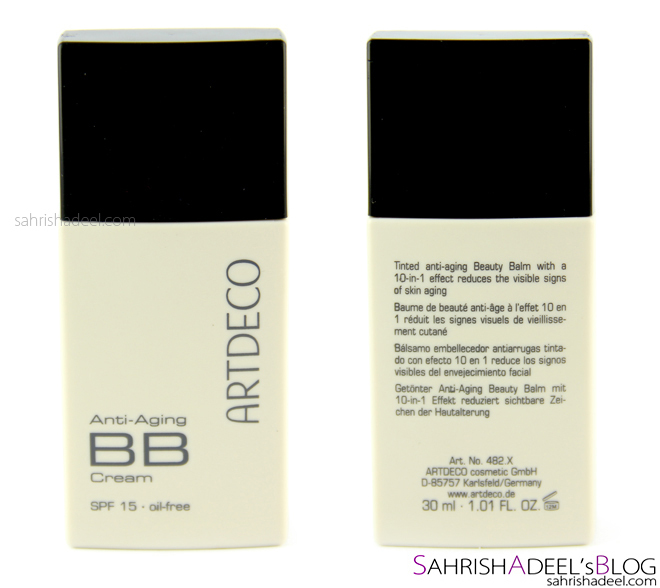 Anti Aging BB Cream by Artdeco is definitely suitable for people aged 35 and above (general age recommendation for anti aging products). In this review I won't only include my experience but my mother-in-law's too. When I got this product, she was luckily here at my place and I asked her to used it. Shade 2 matched her skin tone and shade 7 was perfect for mine. Her Experience - in my words: (Age : 50+, Skin type: Oily) This BB Cream is very light on skin, gives nice coverage and is really easily blend-able. It stays for long hours and does not need to be powdered. Also, it does not get into lines and wrinkles. It clings onto the dry patches easily so exfoliation is must. I now prefer using this BB Cream instead of my foundation in everyday routine. My experience: Even though I loved this BB Cream and I desperately want to get it in full size, I still won't use it until I need anti aging products but if you believe that you can delay aging signs even more if you start to use anti aging products earlier, be my guest and get one for yourself. I found this BB Cream really easy to work with both with a buffing brush and with my fingers. Generally, when I am in hurry, I use Ronasutra's Retractable Kabuki Brush to blend it in less than a minute. That brush is just magic as it is the softest kabuki brush I have ever used and it gives a flawless finish. This cream literally does not get into fine lines and covers up most of my redness and discoloration in a sheer layer but at that point, I can still see redness on my cheeks peeking though it a bit. So I quickly dab my brush (without using anymore product) on those areas and it helps to cover up even better. This is the most light BB Cream I have ever used and it looks exactly like skin. However, if you have dry patches, it might cling onto them so better exfoliate in everyday routine. Also since this cream is oil free, it is suitable for all skin types but with that it might feel a bit dry on dry skin so moisturize if need to. Only negative thing that I notices about it that it has a bitter taste, No I don't eat it but I tend to take my base onto my lips a bit and you know how some people have this habit of licking their lips and that what happens to me too. And it has a smell like those medicated soaps and face washes have. I don't mind that because most of my life I was using medicated product because of my sensitivity to fragrances. Also, this product should have a wider shade range. Overall, I love this BB Cream and I know I have a anti aging BB Cream waiting for me. 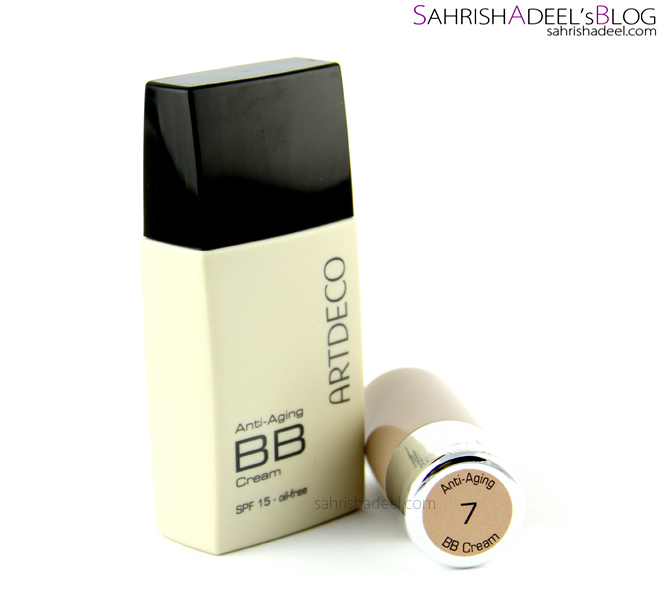 Artdeco Anti Aging BB Cream costs 2290 PKR and is available on almost all super stores where you can find Artdeco's products. Join Artdeco Pakistan's Facebook page to stay tuned for new launches and product details. You can also order it only from Just4Girls.pk if you are living in Pakistan. I haven't spotted Artdeco in Malaysia yet but there are many only websites who are shipping Artdeco products internationally. Are you a fan of BB Cream just like me? What are your favorites?